Our Spring 2016 issue is filled with images of our models wearing the luxury line of Amarxx lingerie (myself included), from contributing MOLL Magazine photographer Vincent Gotti. Shot on location in Darling Point Sydney NSW Australia, Vincent brings us a crop of new faces. Q: Lets begin with an ice breaker. You have 24 hours and are competently invisible to anyone or anything, where would you go and what would you photograph? Tough question. I think I would go to Buckingham Palace and photograph the interiors of the place. Q: Tell us a little bit about yourself? I am a very simple man. Married for the last 25 years and have 2 amazing children that always inspires me to be a better photographer. Q: Most daring thing you’ve ever done in the name of love? Most daring thing in the name of love would have to be, having kids for sure. No doubt. 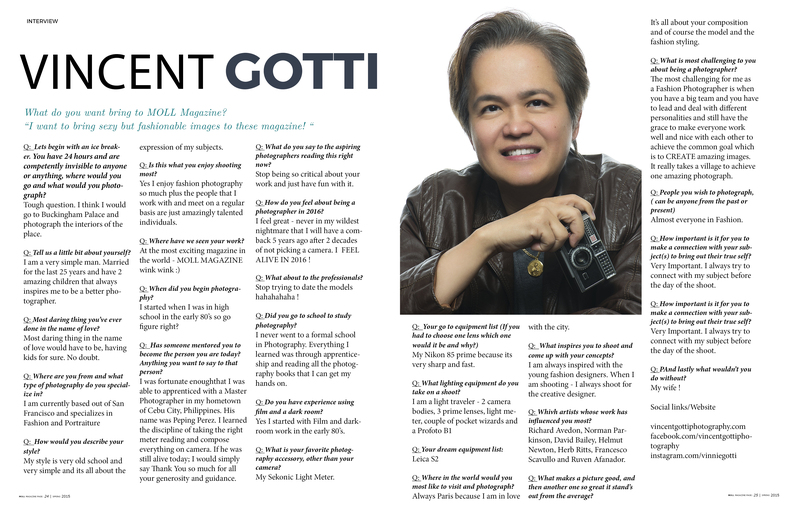 Q: Where are you from and what type of photography do you specialize in? My style is very old school and very simple and its all about the expression of my subjects. Q: Is this what you enjoy shooting most? Yes I enjoy fashion photography so much plus the people that I work with and meet on a regular basis are just amazingly talented individuals. Q: Where have we seen your work? Q: When did you begin photography? I started when I was in high school in the early 80’s so go figure right? Q: Has someone mentored you to become the person you are today? Anything you want to say to that person? I was fortunate enough that I was able to apprenticed with a Master Photographer in my hometown of Cebu City, Philippines. His name was Peping Perez. I learned the discipline of taking the right meter reading and compose everything on camera. If he was still alive today; I would simply say Thank You so much for all your generosity and guidance. Q: What do you say to the aspiring photographers reading this right now? Stop being so critical about your work and just have fun with it. Q: How do you feel about being a photographer in 2016? I feel great – never in my wildest nightmare that I will have a comback 5 years ago after 2 decades of not picking a camera. I FEEL ALIVE IN 2016 ! Q: What about to the professionals? Stop trying to date the models hahahahaha ! Q: Did you go to school to study photography? I never went to a formal school in Photography. Everything I learned was through apprenticeship and reading all the photography books that I can get my hands on. Q: Do you have experience using film and a dark room? Yes I started with Film and darkroom work in the early 80’s. Q: What is your favorite photography accessory, other than your camera? My Nikon 85 prime because its very sharp and fast. Q: What lighting equipment do you take on a shoot? Q: Where in the world would you most like to visit and photograph? Always Paris because I am in love with the city. Q: What inspires you to shoot and come up with your concepts? I am always inspired with the young fashion designers. When I am shooting – I always shoot for the creative designer. Q: Whivh artists whose work has influenced you most? Richard Avedon, Norman Parkinson, David Bailey, Helmut Newton, Herb Ritts, Francesco Scavullo and Ruven Afanador. Q: What makes a picture good, and then another one so great it stand’s out from the average? It’s all about your composition and of course the model and the fashion styling. Q: What is most challenging to you about being a photographer? The most challenging for me as a Fashion Photographer is when you have a big team and you have to lead and deal with different personalities and still have the grace to make everyone work well and nice with each other to achieve the common goal which is to CREATE amazing images. It really takes a village to achieve one amazing photograph. Q: How important is it for you to make a connection with your subject(s) to bring out their true self? Very Important. I always try to connect with my subject before the day of the shoot. Q: PAnd lastly what wouldn’t you do without?